SELDA’s anniversary is a somber reminder that the conditions and the structures that necessitated its founding in 1984 remain and persist today. SELDA’s anniversary is also a testament to the bravery, courage and steadfastness to struggle for what is right, just and democratic by the thousands of men and women who have been arrested, tortured and imprisoned for their political beliefs and actions from the dark days of the fascist dictatorship and which continues on today. The Canada Philippines Solidarity for Human Rights (CPSHR) sends this solidarity message to SELDA, the militant organization of former political prisoners in the Philippines, in its 26th founding anniversary. We support SELDA in its task of not only working for the release and welfare of over three hundred political prisoners but also of taking care of former political prisoners and their families. In particular, we support the hunger strike of political prisoner Ramon Patriarca which started on June 1, 2012 to protest his continued detention in the military camp, where he was brought and tortured after his arrest in 2009. He is on hunger strike against the military’s violation of a recent court decision ordering his transfer to a regular detention facility in Cebu. Patriarca, a consultant with the National Democratic Front of the Philippines (NDFP), is among the group of NDFP consultants who remain in jail in violation of the Joint Agreement of Safety and Immunity Guarantees agreed upon by the NDFP and the Philippine government to protect peace consultants from antagonistic acts such as arrest and detention. The Aquino government continues to renege on its pledge to release political prisoners as it continues to suspend the peace talks with the National Democratic Front. The continuing failure of the Aquino regime’s to fulfill its pledge to immediately release political prisoners is a serious obstacle to the peace talks and discussions on socio-economic reforms as well as on political and constitutional reforms. Freedom for all political prisoners is an integral demand to the various democratic demands of the Filipino people, an integral part of all proposals for ending the civil war and for building democracy in the country. Freedom for all political prisoners is a matter of justice and redress for all that have been inflicted on the political prisoners, from the moment of their arrest, to the trumped up charges against them, their criminalization and their continuing detention. Your demand is loud, your main call is clear: Free All Political Prisoners! We stand and work in solidarity with your call to FREE ALL POLITICAL PRISONERS! We, political prisoners at the Philippine National Police Custodial Center in Camp Crame, Hail the Samahan ng mga Ex- Detainee Laban sa Detensyon at Aresto (SELDA) on its 28th founding Anniversary this year. SELDA was formed by ex- political detainees about a year after thousands of them all over the country gained freedom in the aftermath of the fall of the Marcos dictatorship in February 1986, as a result of the unrelenting, widespread, militant people’s struggle against the dictatorship throughout the 13 plus years of its fascist rule, culminating in a massive popular uprising at EDSA that finally toppled the hated regime and opened the gates that had been barring its political critiques. Even as a human rights organization, SELDA is distinct in that, aside from its being devoted to promotion and respect of human rights and the interest of the people, it is particularly devoted to political detainees—following them and looking after their needs and concerns, supporting the fight for their freedom and against violations of justice, human rights and other rights in this cases. SELDA continued to bind ex- political detainees, and to be one with and devote itself to the cause and support of those who have also become and continue to be political detainees , even after the end of the Marcos fascist dictatorship and where there are (Officially) supposed to be more political detainees. Ex- political detainees, who experienced the extra ordinary oneness developed among their ranks because of the cruel experiences, most difficult trials and courageous militant struggles they went through; the intense political learning, tight comradeship and mutual support they developed in prison, not to mention their having been together 24 hours a day in many cases for long stretches of time; the devoted wide support they receive from relatives, comrades, friends, human rights organization and other advocates and sympathizers of their cause outside prison, in the country and abroad, and the many victories they won in collective struggles, cannot forget these. Having gone through such experiences that present political detainees are going through, they intimately sympathize with and particular extend their comradeship support and that they have gained through their own experiences and struggles to those who have now become political detainees under post-martial law regimes up to the current, that wear only democratic facades and keep lying that there are no longer political prisoners at present. We, current political prisoners, who share such unity and benefit from their support under our present conditions, express our oneness and gratitude for such support that SELDA and its members have given and continue to give us political prisoners of the present, and will continue to give to many more who will be political prisoners for as long as the prevailing rotten, exploitative and oppressive political and socio – economic system we are resisting and struggling against continues to rule genuine freedom and democracy have let to be attained by the suffering people, and respect for human rights and other people’s rights and interests still have to be militantly and resolutely fought for, even at the risk of political imprisonment or worse. On the occasion of the celebration of the 26th anniversary of SELDA, we of move and resist! Aktionsplenum gegen Ausgrenzung und Abschiebung & Antira AG (Plenum for Action against Deportation and Exclusion/Antiracist Working Group) in Bielefeld, Germany gladly declare our solidarity with you! Altough some of us had already heard about you through Medy, Pido and Pepe, we are now formally informed about your organization and your important work. It opens our eyes to the reality and even increasing number of political prisoners in the Philippines. In our group’s work against the brutal policies of deportation, isolation and day-today racism in Fortress Europe, the fight against the inhuman „Lagersystem“ (places for detention and isolation of refugees in Germany) is one of our main concerns. Our support for the refugees’ struggle against this oppression puts us in close solidarity with you. We hope to learn more about your work and send our best wishes. Please accept my warmest greetings of congratulations to SELDA and to all of you present in this gathering! I am deeply honored to have been asked to send you a message on the occasion of your celebration of the anniversary of SELDA’s first general assembly on26 May 1986atSt. Joseph’s College in Quezon City. Let me take this opportunity to tell you some highlights of the founding and early years of SELDA. SELDA was formed on4 December 1984at the residence of Don Chino Roces with the first meeting of its Board of Directors. If I’m not mistaken, our first Board had eleven members, including Roces, former Senator Soc Rodrigo, Jake Almeda Lopez, Ben Guingona, Jose Mari Velez, Dean Armando Malay, Julie de Lima-Sison, Dan Vizmanos, Francisco Nemenzo, Jr., and Romy Candazo, with myself as secretary-general and Board member. This was the founding of SELDA. The Board constituted a fair representation of the various political forces and personalities that suffered imprisonment for opposing the Marcos dictatorship. We met at least once a month, alternating between the houses of Chino Roces and Soc Rodrigo. After several meetings of the Board, we adopted a Constitution. We set this as SELDA’s main objective: to work for the release of all political prisoners and the protection of their rights and welfare, while extending moral and material support to their families. We proceeded to recruit members from the ranks of former political prisoners. I managed to persuade former Vice-President Teopisto Guingona, Senator Joker Arroyo and former Senator Nene Pimentel to join SELDA. They were my co-detainees in Bicutan in 1978. If I recall correctly, they were dues paying members. But this was the time of great upsurge in the democratic mass movement. Large multisectoral organizations were formed. After JAJA (Justice for Aquino, Justice for All) came the Nationalist Alliance for Justice, Freedom and Democracy or NAJFD and finally Bagong Alyansang Makabayan or BAYAN on25 May 1985. SELDA personalities and members were drawn into the various organizations and consequently its expansion and first general assembly were put on hold. It is not generally known, but at the height of the EDSA uprising in 1986, SELDA members played a role in getting President Cory Aquino to issue a statement of concern and warning to Marcos and his troops to ensure the safety and security of political prisoners in the various military camps in the country. I called Rene Saguisag, one of Cory’s spokespersons then, to relay SELDA’s concerns to Cory, while Dean Malay and others got an audience with Gen. Fidel V. Ramos at his headquarters inCampCramewith the same concern. On the filing of the human rights case against Marcos in the US, let me tell you that the SELDA Board took a formal decision to approve this course of action after Mari Velez, then Chairperson of SELDA, was approached by Robert Swift on the latter’s offer to file a class suit on behalf of victims of human rights violations under the Marcos regime. SELDA was chosen as the lead organization in the human rights case to be supported by FIND, the organization of relatives of victims of enforced disappearances, and other human rights organizations. It was SELDA that gathered the documentation of the close to 10,000 named victims and selected the witnesses in the human rights case. These facts cannot be erased from the record by those who now seek to deny the role of SELDA in this historic case – to the extent of excluding more than 2,000 documented victims, most of whom are SELDA members. SELDA has had a long and proud record of promoting and defending the human rights of political prisoners and their relatives since the dark days of the Marcos dictatorship and through all the succeeding oppressive regimes which continued incarcerating and torturing pro-people and progressive oppositionists and dissenters. I, and all of us, expect SELDA to continue this noble work, especially under the current Noynoy Aquino with its arrogance and hypocrisies. More and continuing power to SELDA! Isang mapagpalayang araw sa lahat ng delegado at bisita na nakikiisa sa pagdiriwang ng ika-26 anibersaryo ng Samahan ng Ex-detainees Laban sa Detensyon at Aresto o SELDA. Ang Bayan Muna Party List ay nakikiisa sa inyong patuloy na pakikipaglaban para sa pagpapalaya ng mga detenidong pulitikal o political prisoners sa bansa at gayundin para sa makataong pagtrato sa kanila ng mga awtoridad habang nasa loob ng kulungan. Isang malaking bahagi ng pagkilos ng mga progresibong party-list tulad ng Bayan Muna sa loob ng Kongreso ay ang pagsusulong at pakikipaglaban para sa Karapatang Tao. Kabilang na riyan ang paghahapag ng mga panukalang batas at resolusyon, pag-imbestiga ng mga kaso ng human rights violations, paglilinaw ng mga isyu ng mga mamamayan, at paghamig sa suporta ng iba pang kongresista at mga senador upang ipagtanggol ang Karapatang pantao at labanan ang mga paglabag dito. Kabilang sa mga naipasang batas ng BAYAN MUNA ay ang Anti-Torture Act, Public Attorney’s Office at nagco-author sa iba pa. Ngayong 15th Congress, pumasa na sa mababang kapulungan ng Kongreso ang iba pang human rights bills tulad ng Anti-Enforced Disappearance Bill at ang Martial Law Victims Compensation Bill. Ngunit hindi pa lubusang naisasabatas ang mga ito dahil sa kailangan pa itong dumaan at ipasa sa bicameral conference at ng Presidente mismo. Kasalukuyan ding dinidinig sa Human Rights Committee ang mga kaso ng mga extra judicial killings at iba pang paglabag sa karapatang tao. Marami pang nakasalang na panukalang batas at resolusyon ang Bayan Muna kung saan kabilang ang House Resolution (HR) 1956 na nag-uudyok kay Noynoy Aquino na ipagkaloob ang General, Unconditional at Omnibus amnesty sa lahat ng political prisoners, detainees and dissenters na biktima ng panggigipit ng estado at HR 1810 na naglalayong imbestigahan ang mga gawa-gawang kaso laban sa mga kritiko ng gubyerno kabilang na ang mga political prisoners. Gayunpaman, ang pagkilos sa loob ng Kongreso ay may malaking limitasyon dahil sa katotohanang institusyon pa rin ito na pinamumugaran ng naghaharing uri sa lipunan. Walang lakas ang Bayan Muna at iba pang progresibong party list sa Kongreso kung walang suporta mula sa malawak na bilang ng mamamayan sa labas ng Kongreso. Ang mga organisasyong tulad ng sa inyo na nagtataguyod sa karapatang pantao, partikular ang kagalingan at kapakanan ng mga bilanggong pulitikal ay sandigan at katuwang namin upang maipaglaban sa Kongreso ang hustisya para sa mga political prisoners at kanilang mga pamilya. Sa kabila ng posturang nagtataguyod ng karapatang tao ang administrasyon ni Noynoy Aquino, nagpapatuloy ang iba’t ibang porma ng paglabag sa karapatang tao. Nananatiling walang hustisya sa 1206 biktima ng EJK at sa 206 desap at kanilang mga pamilya, nadadagdagan pa ang bilang ng mga ito. Nagpapatuloy ang pagkakakulong ng humigit-kumulang 350 detenidong pulitikal sa kabila ng pangakong pagpapalaya sa kanila. Napako na ang maraming pangako at nananatiling pangarap ang hustisyang matagal nang minimithi nila at ng kanilang mga pamilya. Mahalaga ang pagbubuklod at paggiging matatag ng SELDA, katulad at kasama ng iba pang organisasyong masa upang harapin at salagin ang mga atake at panunupil ng estado at ng mga armadong pwersa nito. Sa pagtitipon na ito gunitain natin ang mga simulain ng organisasyon, ang mga nakamit na tagumpay, ang mga sakripisyo at buhay na inalay na ng maraming martir, at huwag kalimutang ang hustisya at kalayaan ay mapapasakamay rin sa patuloy ng pagsulong ng kilusan ng mamamayan. Mabuhay ang mga bilanggong pulitikal! The Kapatirang Simbahan Para SA Bayan (KASIMBAYAN) salutes the Samahan ng Ex-Detainees Laban SA Detensyon at Aresto (SELDA) as it celebrates its 26th year of steadfast commitment to pursue a vision of society where there is no political prisoner. Imprisonment has always been a way of the tyrant to silence and prevent the freedom-fighters and social justice advocates in exposing and opposing the oppressive schemes of the elite rulers. The exploiters and the looters of the people’s wealth and resources use the laws, the courts, military and prison bars to incarcerate those who work for justice and human dignity. SELDA has marked an impressive testimony of faithfulness in working for freedom, justice and peace. While members have been victims themselves of injustice, they relentlessly carry forward the cause that would set the captives free. They were tortured and suffered various forms of humiliation, but their hearts and minds have never been caged. Their principles and convictions remain unbroken. Their desire for freedom has never been deflated. We offer our respect and high regard to SELDA for its testimony. SELDA has afflicted in every way, but not crushed; perplexed, but not driven to despair; persecuted, but not forsaken; struck down, but not destroyed; (2 Corinthians 4:8-) . Today, the Aquino government has a lot of accountability especially on the issue of human rights. It could not brag about democracy and “matuwid na daan” slogans as there are more than 300 political prisoners suffering for the crimes invented and maliciously schemed by the state. 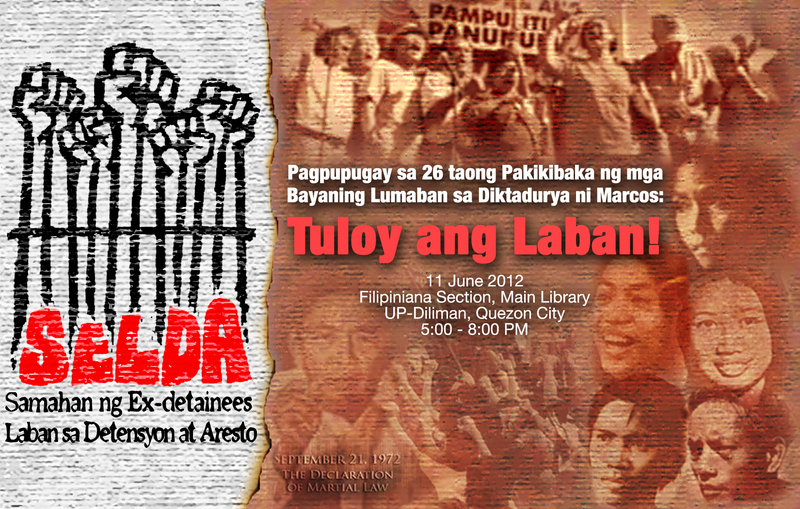 We join the SELDA and all freedom loving Filipinos in the resounding cry: FREE ALL POLITICAL PRISONERS. Mainit na pagbati ang pinapaabot ng Promotion of Church People’s Response (PCPR) sa pagdiriwang ng ika-26 anibersaryo ng pagkakatatag ng Samahan ng Ex-Detainees Laban sa Detensyon at Aresto (SELDA). Nagpupugay ang PCPR sa katatagan ng mga kapatid natin sa SELDA na ipagtanggol ang dignidad at buhay di lamang ng kaniyang kasapian kundi ng buong bayan laban sa paglabag ng estado sa karapatang pantao. Ang pagkakatatag at tatag ng SELDA mula noong diktaduryang Marcos hanggang sa kasalukuyan ay simbolo ng patuloy na pasismo ng estado, kawalan ng katarungan at kapayapaan sa ating bayan. Ang mga layunin at adhikain nito ay hindi kailanman naikulong ng rehas na bakal bagkus namutawi sa marami pang iba upang pagpunyagian na isulong. Kayo din ang sumisimbolo ng masikhay na paghahangad ng sambayanan para sa tunay na pagbabago at pagigiit ng karapatan. Di matatawaran ang inyong marubdob na pagkilos sa kabila ng maraming mga balakid at pangamba sa buhay upang maging kaisa sa pangarap ng sambayanan ng isang lipunang may katarungan, tunay na kapayapaan at paggalang sa karapatang pantao. Kaming mga kabahagi ng PCPR ay kaisa sa inyong paninindigan na di kailanman naaayon sa batas ng tao at lalong labag sa kagustuhang ng Panginoon ang anumang uri ng pagyurak ng karapatan sa pagigiit na kamtin ang ipinangakong buhay na ganap at kasiya-siya. Kaisa ninyo kami hangga’t may mga detenidong pulitikal, ilegal na inaaresto at nilalabag ang karapatang pantao. Tulad ninyo, naniniwala kaming ang tagumpay ay nasa sama-samang pagkilos. Sama-sama nating babaklasin ang karsel ng pagsasamantala at pang-aapi sa ating bayan. Tayo ay magtatagumpay, tayo ay magpapalaya. Mabuhay ang patuloy na pakikibaka para sa tunay na kalayaan at katarungan! As a former political prisoner and member of SELDA (Samahan ng Ex-Detainees Laban sa Detensyon at Aresto) and as Chairperson of the International League of Peoples’ Struggle (ILPS), I salute and congratulate the SELDA, its current officers and all members for their struggle for the democratic rights and freedom of all the political prisoners since the founding of SELDA on December 4, 1984. I am proud to say that even while I was still a political prisoner I was consulted about the founding of SELDA. Since then, SELDA has become the most outstanding organization in the Philippines in defending the rights of political prisoners, working for their release and mobilizing moral and material support for them and their families before and after said release. Known all over the world is the great success of SELDA in pursuing the human rights litigation against the Marcos estate in the US court system and in documenting the victimization of close to 10,000 Filipinos who suffered extrajudicial killings, forced disappearance, torture and illegal detention during the Marcos fascist dictatorship. Without the work of SELDA, the case against Marcos would not have succeeded. But certain elements have sought to deny the role of SELDA and make a scam for their political and material benefit, going to the extent of excluding 2000 documented victims (including prominent political prisoners and former officers of SELDA) and replacing them with fake claimants in order to spite SELDA. Year in and year out, there is a bill in the Philippine reactionary congress intended to indemnify and rehabilitate political prisoners and victims of human rights violations under the Marcos fascist regime. But in various ways, such a bill has been sabotaged and fallen short of enactment. SELDA is thus challenged to find ways of effecting a just legislation for the benefit of the victims of human rights violations under the Marcos fascist regime that participated in litigation against Marcos in the US. It is ironical that the reactionary government which has continued the Marcos policies of puppetry to imperialist powers, corruption, plunder and human rights violations and which has never done justice to the victims of human rights violations from the time of Marcos to the present is posing as the possible dispenser of justice and the possible provider of resources for indemnifying and rehabilitating the victims and their families. In the course of the GRP-NDFP peace negotiations, I have warned several times that the failure to do justice to the victims of the Marcos regime compounds the injustice to them and their families and serves as strong cause for revolution. But from one reactionary regime to another, we have seen the ceaseless exploitation and oppression of the people and the infliction of the worst human rights violations on those activists who seek the national and social liberation of the people. The reason for the existence and further development of SELDA is the continuance of human rights violations and the need to fight for the basic democratic rights and fundamental freedoms of the people. And it is fine that among the human rights organizations, SELDA is focused on defending the political prisoners and seeking their release and rehabilitation. The SELDA is commendable for seeking the release of political prisoners in the time of every reactionary regime. It must be credited for the release of political prisoners, usually done in significant number at the early part of every reactionary regime. But today we are confronted by the vicious regime of Aquino who delayed the release of the Morong 43 despite the strong domestic and international public clamor and who now appears to relish the indefinite detention of hundreds of political prisoners (356 at the current count). These political prisoners are being detained in violation of the International Bill of Rights, the International Humanitarian Law, the Comprehensive Agreement on Respect for Human Rights and International Humanitarian Law and the Hernandez political offense doctrine. On the charge sheets, they are accused of participating in the rebellion of the revolutionary forces of the people and yet they are detained and penalized for common crimes. Among the political prisoners are those protected by the GRP-NDFP Joint Agreement on Safety and Immunity Guarantees (JASIG). Yet they are not released, thus causing the paralysis of the GPH-NDFP peace negotiations. It is of the highest importance that SELDA demand and work for the release of the political prisoners, including those very few protected by JASIG. It is a matter of justice and adherence to human rights that the political prisoners must be released immediately. It is also a matter of improving the conditions and atmosphere for negotiating a just peace. A regime that relishes the indefinite imprisonment of political prisoners is perverse and cannot be trusted. The Aquino regime claims to be different from the Arroyo regime. But in fact the Aquino regime is not different. It is hell-bent on continuing the Arroyo policies of puppetry,, plunder and gross human rights violations. It is keeping the political prisoners of the Arroyo regime and it is adding its own. It is increasing the number of those unjustly arrested, imprisoned , tortured and murdered by its military and police forces under Oplan Bayanihan. SELDA has the noble mission of defending the rights of the political prisoners and seeking their release. This mission must be fulfilled if we are to become a better and stronger nation. SELDA must activate and muster the support of all former political prisoners and their friends. The high positions of respect and influence of a considerable number of former political prisoners must be combined with mass mobilization in order to obtain the freedom of all the current political prisoners.